I had a gap between my appointments yesterday so I thought I’d go get a sandwich instead of being stuck at the clinic doing nothing. On the way to my favorite little restaurant near the clinic I discovered a new bakery. The shop window had all these wonderful loaves of bread.the one that caught my eye though was one that looked like focaccia bread only thicker.. the smell was irresistible.. There is something about the smell and warmth of a freshly baked loaf of bread that I find enchanting.. I went in and got one of those focaccia like bread loaves and it turned out it was made with olive oil and oregano..YUM. I was supposed to have a picture of it for you but it disappeared shortly after I got home lol. My little boy insisted on calling it a cake! my daughter on the other hand who is addicted to all things that are remotely related to oregano ate it up without a spread or a dip! It inspired me to try recreating at home maybe over the weekend..will keep you posted. Back to my little restaurant. It is a 45-year-old tiny place that still has the same owner. It makes the best falafel sandwich in town and mind you it only sells falafel sandwiches, nothing else. Which might seem like a crazy idea because a restaurant which serves just one dish is bound to fail right? actually in this case it’s wrong!…the place is so successful in fact that the walls are covered in framed newspaper clippings documenting its success. That is what I love most about the place… the spirit in it. The pride in the eyes of its owner..the pride in a job done to perfection for so long. The idea of doing something you like and enjoy..YOUR WAY..and to excel in it for so many years is to me.. inspiring to say the least. Now back to my sandwichmania and another one of my favorite sandwiches. Super easy, super quick and super tasty. Exactly the way a sandwich should be! I usually make this with akkawi cheese but feta does the job nicely too. If using akkawi I like to boil it to make it softer and to reduce the salt in it a bet. 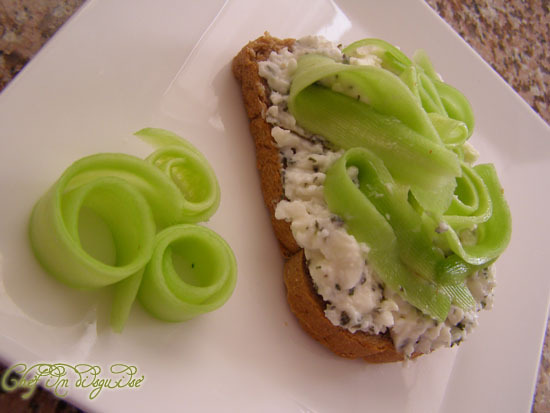 Adding mint to the cheese adds an element of freshness that goes beautifully with the cucumbers. You could serve this as open-faced sandwich if you like. Posted in Breakfast, Sandwiches and tagged akkawi cheese, breakfast, cucumber sanwich, feta cheese, focaccia bread, postaweek2011, sandwich. Bookmark the permalink. That’s a delicious sandwich, just the way I like sandwiches! Like it so much, very simple and delicious. 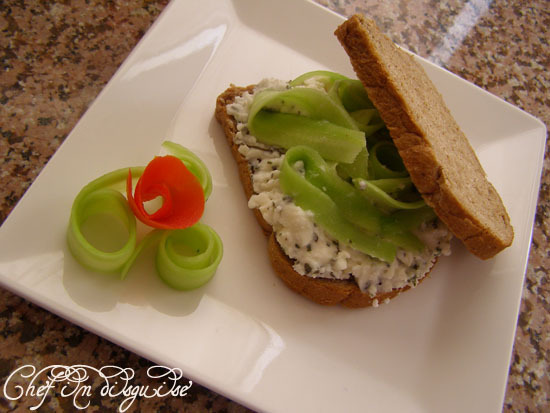 I like the addition of the mint to your cucumber sandwich, would add a nice flavor.